The Murray Man swim in Lake Bonney consists of a clockwise rectangular course of 1km in length. The Start area will be in front of the Yacht Club in waist deep water. The Murray Man bike course consists of an out and back 20km loop from the Lake Bonney Yacht club to the far side of Lake Bonney and return. There will be a drink bottle exchange available at the completion of each 20km loop (in front of the yacht club). 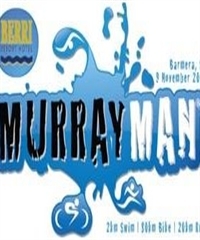 The Murray Man run course consists of a 5km loop from the Lake Bonney Yacht club around the streets of Barmera and return.